GRAFT provides CLI wallet, mobile wallets, and desktop wallets for Windows and Mac. All wallet apps now are able to send GRFT to other wallets, which is functionality that initially was available only in CLI wallet. We also added support for longer integrated addresses required for sending funds to exchanges. It is important to understand the difference between current Send function and future Pay and Transfer functions. To add to the confusion, Send in mobile and desktop wallets is the same as Transfer in CLI wallet. So let’s see why these three functions are different and what they are designed for. Send (aka Transfer in CLI wallet) is “traditional” transaction between GRAFT addresses. It is implemented by creating a transaction and adding it to the next block on the blockchain. This is slow process which can take from 2 to 10 minutes (depending on current blockchain “traffic” and interval between the blocks). 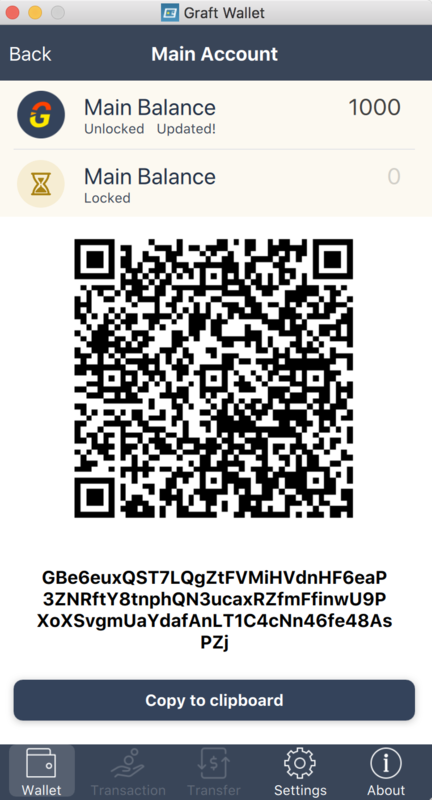 Also, the balance in the recipient wallet becomes “unlocked” (available for next transaction) only after 10 confirmations (10 blocks) which adds another 20-30 minutes. GRAFT Send is similar to bank wire transfer; however, it is still much faster than wire (minutes vs. hours) and cheaper (cents vs. dollars). The good thing about Send is that it can move GRFT from any address to any address, no matter what GRAFT app you are using, including third party bodies such as exchanges. The downsides are low speed of transaction and the fee paid by the sender in addition to the transaction amount (although GRAFT set a very decent fee which is lower than in most other cryptocurrencies). Pay is based on GRAFT RTA (real time authorization) technology and conducts a payment transaction between GRAFT wallet and GRAFT POS (point of sale), or any POS compatible with GRAFT or equipped with hardware payment terminal supporting GRAFT. Pay is currently only implemented on RTA testnet and still in alpha phase; it is currently disabled on mainnet. RTA is one of the most significant GRAFT features which facilitates instant payments between buyers and merchants using GRFT and other cryptocurrencies, both at brick and mortar stores and online. GRAFT Pay is similar to credit/debit card payment; however, unlike credit/debit card payment, GRAFT Pay is absolutely secure and private: the identity of sender and recipient, the transaction amount, and even transaction fee are invisible to the public looking at the blockchain. Main advantages of Pay comparing to Send are instant authorization (within a few seconds) and no fee paid by the buyer (sender) as the fee is paid by the merchant. Transfer allows limited number of transactions between user wallets free of charge (no fee paid by either sender or recipient). This function is available only to authenticated users, i.e. the users who agree to partially “compromise” their privacy in order to get additional benefits from the network, or to the VChain owners (you can find more info about VChains in the latest version of GRAFT White Paper). GRAFT Transfer is similar to bank ACH transfer: both are free. GRAFT Transfer, however, is much faster then ACH (seconds vs. hours/days). GRAFT Transfer is scheduled for implementation before the end of 2018. It is important to mention that all three methods of GRAFT transactions are still based on GRAFT Blockchain which means they provide full security and privacy to both sender and receiver. Standard GRAFT address is 95 characters long and always starts from letter “G”. Integrated GRAFT Address contains unique Payment ID in addition to the pair of public keys. Although integrated address does not hide your keys or payment ID from public view, it is always different because of the different payment ID. Many exchanges require using integrated address in order to top up the balance. GRAFT Integrated address is 106 characters long and also always starts with letter “G”.